SUMMARY: Email, at its very core, is a one-on-one medium. The challenge for marketers is to send to the many potential customers on their opt-in lists without losing the intimacy of that one-on-one communication. In this week’s chart, we’ll discover what effect personalized subject lines have on open rates. "Remember that a person’s name is to that person the sweetest and most important sound in any language." This is one of Dale Carnegie’s tips for winning friends and influencing people. And getting marketing emails opened? Let’s take a look at the research. The chart above is a custom analysis developed for MarketingSherpa based on Experian Marketing Services’ quarterly email benchmark analysis from client brands within the United States and Canada that have opted to participate in this study. These metrics reflect average performance at seven days after the emails have been sent. This is across billions of emails each quarter. As you can see in the above chart, including a name in the subject line boosted open rates by 29.3%. But the effect varied widely across industries. 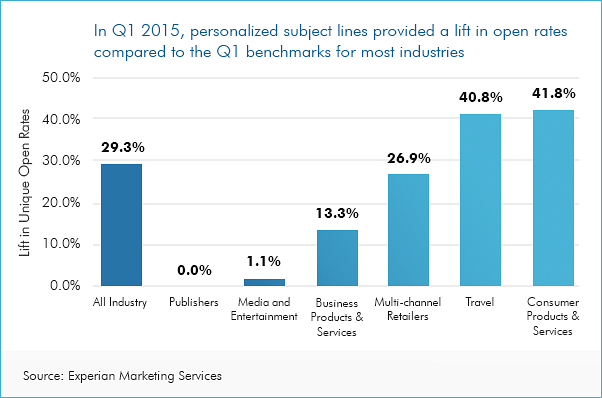 For consumer products and services companies, personalized subject lines produced a 41.8% increase in open rates with the travel industry not far behind at 40.8%. However, there was no change for publishers and only a minimal impact (1.1%) for media and entertainment companies. The impact didn’t end at the open. Transaction rates were 49% higher (0.09% compared to 0.06%) and revenue per email was 73% higher ($0.15 compared to $0.08) with personalization, according to Experian. "Consumers expect their interactions with a brand to be dynamic and personally relevant," said Shelley Kessler, Manager of Reporting and Analytics, Experian Marketing Services. "A brand that recognizes a subscriber by name in the subject line of an email is able to establish an immediate, personal connection with that subscriber and that is reflected in our research — campaigns with personalized subject lines achieve higher open rates than those with subject lines that are not personalized." If you’d like to include personalized subject lines as a part of your sends, you must first have the information to personalize with. It’s tantalizing to strip as much friction and anxiety out of an email signup form by asking for nothing more than an email address. However, this prohibits you from sending personalized emails. Make sure your opt-in forms ask for a first name at least. Look for other ways to build your list. If you include opt-in capability during transactions, you are likely to get more reliable data from customers as they purchase, thereby increasing your odds of getting quality information. This lack of data may be one reason that only a minority of brands — 35% — are personalizing subject lines. Another reason may be that even effective tactics can lose their effectiveness if they are overdone. "While we do not recommend that every email include a subscriber's first name — it can get old — all brands should make personalization a part of their subject line strategy," Kessler advised. "Marketers can start by testing personalized promotional and targeted trigger campaigns such as welcome messages, thank-you emails, renewals and reactivation mailings."